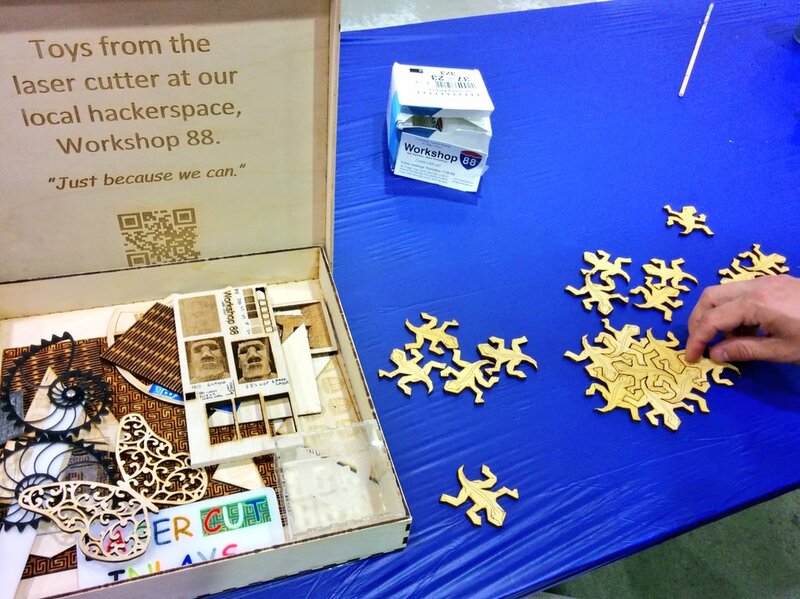 Andrew and Jim represented Workshop 88 at the Southland Mini Maker Faire in Mokena August 27th. That Faire is run by Jay Margalus, one of Workshop 88’s founders. 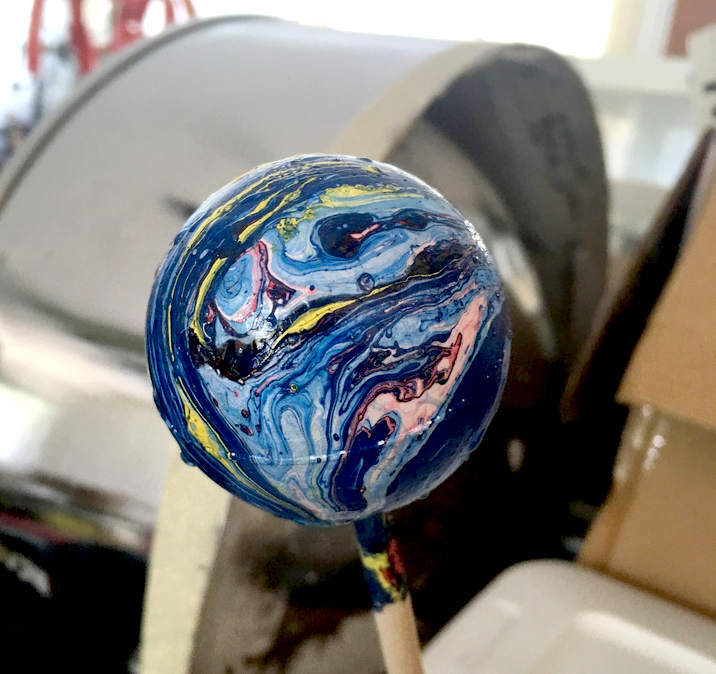 Andrew’s workshop for kids to create their own hand-dipped paint-film artworks was a big hit, with dozens of delighted artists taking home their masterpieces. Foam balls were the canvas; a bucket of water was the studio. The technique, invented by Andrew using a film of spray paint on a tub of water, was inspired by a similar approach he’d seen using nail polish. Less-than-perfect results with the polish caused him to test and perfect the paint approach. Results were spectacular. The laser toys box was there, as usual, and its Escher lizards provided entertainment and education for many little (and not-so little!) hands. Having the back sides of the laser-cut pieces engraved with three different patterns provided an additional level of challenge based on the 3-way tessellation as a 3 color map problem. The laser engraved wording on what used to be the bottom of the tray used to be obscured by the toys. With the addition of the new slightly smaller lower box, that old tray is now both a useful top cover and a convenient display card! 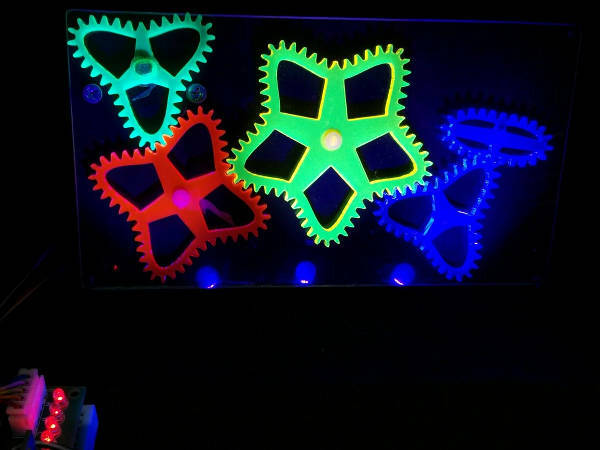 Jim’s UV-lit fluorescent non-round gears caused lots of folks to stop and take a look. Their graceful turning, speeding up, slowing down, reversing and repeating mesmerized a few visitors. Their stepper controller and Tiny85 processor mostly worked, but required some discreet wiggling several times to keep it all going. The flaky solderless breadboard that hosted them has since been replaced by a much more reliable dedicated PCB. 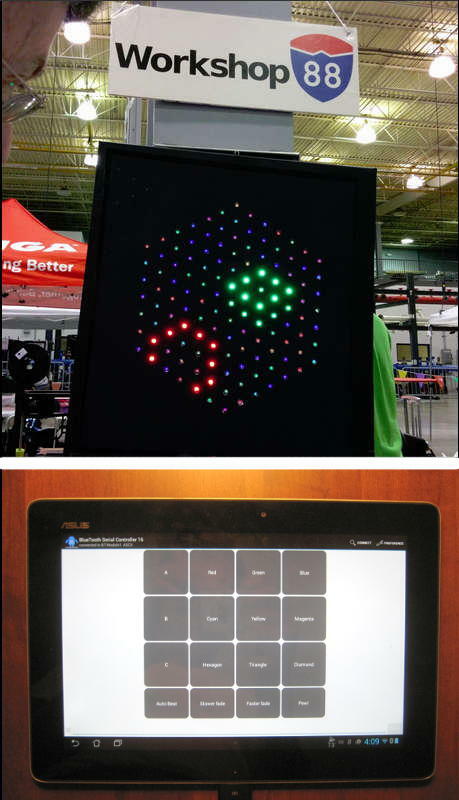 His hexagonal WS2812 individually addressable RGB LED wall display made its debut as an actual interactive device at this Faire. Controlled by a 16-button app on an Android tablet, connected via Bluetooth to a cheap radio on the Arduino that runs the display, the display was fun to make dancing patterns with to music from a small sound system on the table. Next upgrade will be a better drum pad app with velocity and aftertouch, and lots more controls. Thanks and a tip of the W88 hat to Drew Fustini for some of these pictures! 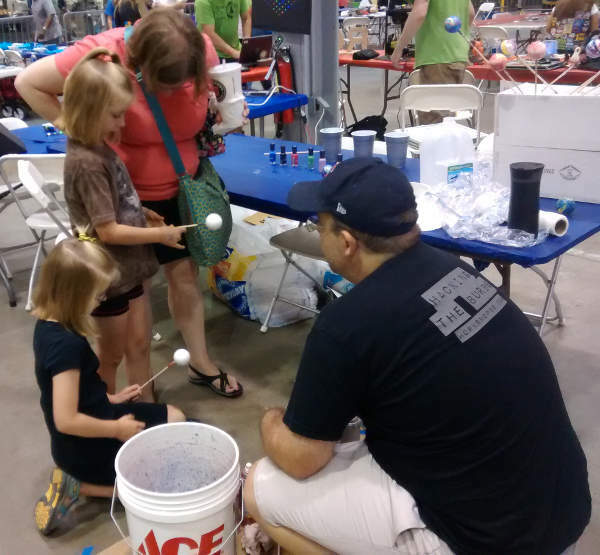 This entry was posted in Events and tagged Maker Faire, mokena, southland by Jim. Bookmark the permalink.